In Chicago last November, Rafael Viñoly Architects’ Chan-li Lin participated in the third installment of the Chicago Architecture Foundation and the Council on Tall Buildings and Urban Habitat (CTBUH)’s joint skyscraper lecture program, Living Tall: What Will Make Tall Buildings More Habitable. Lin, along with a group of esteemed peers, including Richard Pulling, Vice President – Sales, Otis Elevator Company; Jim Burnett, President, OJB Landscape Architecture; James Loewenberg, Co-Chief Executive Officer, Magellan Development; and CTBUH Executive Director Antony Wood, discussed the ways in which tall buildings can better connect to the surrounding urban fabric. 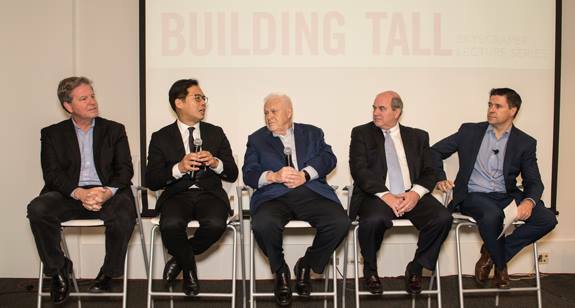 The discussion was preceded by short presentations given by each panelist, including Lin’s on Rafael Viñoly Architects’ recent tower projects: One Grant Park in Chicago; and a number of residential towers in New York City. Video of the full discussion and presentations is available to watch online here.